The goal of any marketing item is to make an impact, but if you’re not sure what type of marketing tool is right for your brand, we suggest utilizing reusable tote bags. Some marketing items are specific to certain demographics, but reusable bags are useful for everyone. These promotional bags will get your brand tons of exposure while also delivering great ROI and living up to your company’s green goals. 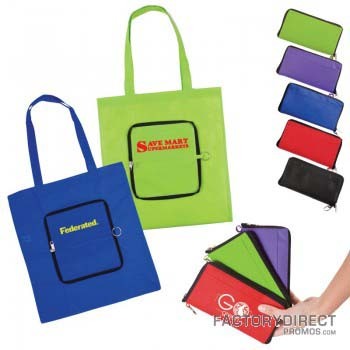 Are you thinking about adding reusable tote bags to your marketing lineup? We are here to help. What Can Reusable Tote Bags Do For Your Brand? The advantage of promoting your brand with custom reusable tote bags is two-fold. When your customers see your reusable tote bags, they will be reminded of your brand. Your logo and marketing information will become more and more familiar to them, another relationship will be strengthened with your brand. When your clients carry your custom reusable tote bags, they will also spread your marketing message to everyone whose path they cross. Reusable tote bags have a very far reach and deliver lots of impressions. We have a large selection of in stock bags available on our site. Find what you like, select the material color and send us your artwork to create your very own reusable tote bags. If you want something a bit more custom, like if you want to alter the size, feature a different material for the handles or gussets, add pockets or do something else altogether, you can follow our super simple 4-step process to design your completely custom reusable bags. Whatever you decide we can help you create reusable tote bags that fit in with your branding and serve as a constant reminder of your company and the products or services you provide. Reusable tote bags are great for trade show takeaways and other events. If you have a trade show coming up this is your chance to create the takeaway every attendee (and even your fellow exhibitors) want to get their hands on. Reusable bags make great takeaways for any event, you can sell them in your online or brick and mortar store, or use them as gifts for clients, vendors, and employees. Whatever you decide to do with your custom reusable tote bags one thing is certain, these bags will continually work to promote your brand. If you are ready to get started you can check out our product line up, or get in touch. Our team is at the ready to answer any questions you have and put together a quote. Previous Previous post: Reusable Bags vs. Recycled Bags: What’s the Difference? Can Schools Lead By Example When Teaching Sustainability to Kids?